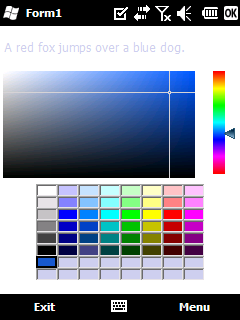 ColorPicker is a graphic software component designed for mobile devices. It displays a color palette you can use to pick the color of your choice. There are two types of palettes you can use – Office and Professional. 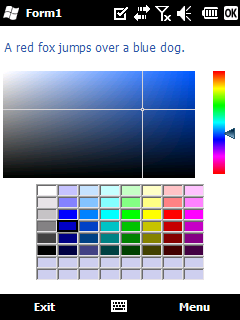 The Office color palette is similar to the one used by Microsoft Office suite applications, and the professional one is similar to Adobe Photoshop’s palette. 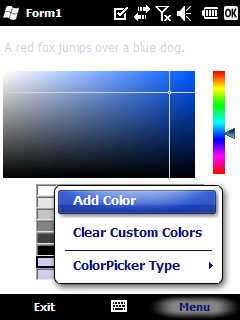 ColorPicker can also display a predefined set of colors that the user can choose from. The whole component is designed for the .NET Compact Framework and is derived from the UserControl class. All of the necessary properties and settings can be set while you’re designing by using Visual Studio’s designer.